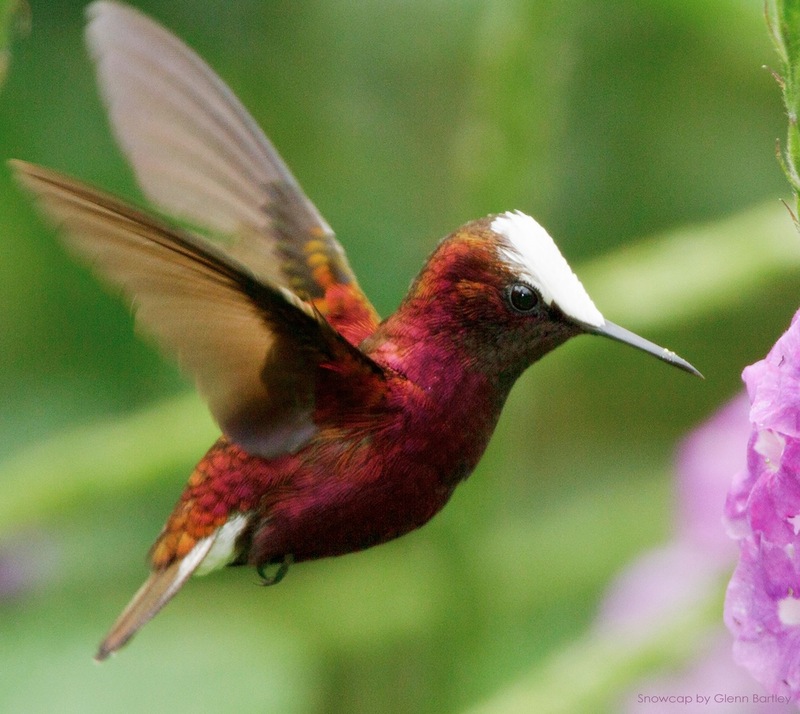 The Snowcap (Microchera albocoronata) is a very small hummingbird that weighs less than a penny. It is the only member of the genus Microchera. This is a tiny hummingbird, 6.5 cm long and 2.5 g in weight, with a short black bill and black legs. The adult male Snowcap is unmistakable. It has the shining white cap which gives this species its English and scientific names, a deep purple body, and white outer tail feathers. The adult female is bronze-green above, dull white below, and has dull white outer tail feathers. She has more white below than other female hummingbirds. Juvenile Snowcaps resemble the adult female, but are duller, have greyer underparts, and bronzed central tail feathers. The purple plumage of young males starts on the underparts as a striking dark central line. The nest is a small cup of plant down and cobwebs decorated with green moss or lichen, which is attached to a small twig or vine. The two white elongated eggs are incubated for just over two weeks, and the female feeds the young on regurgitated nectar and insects. 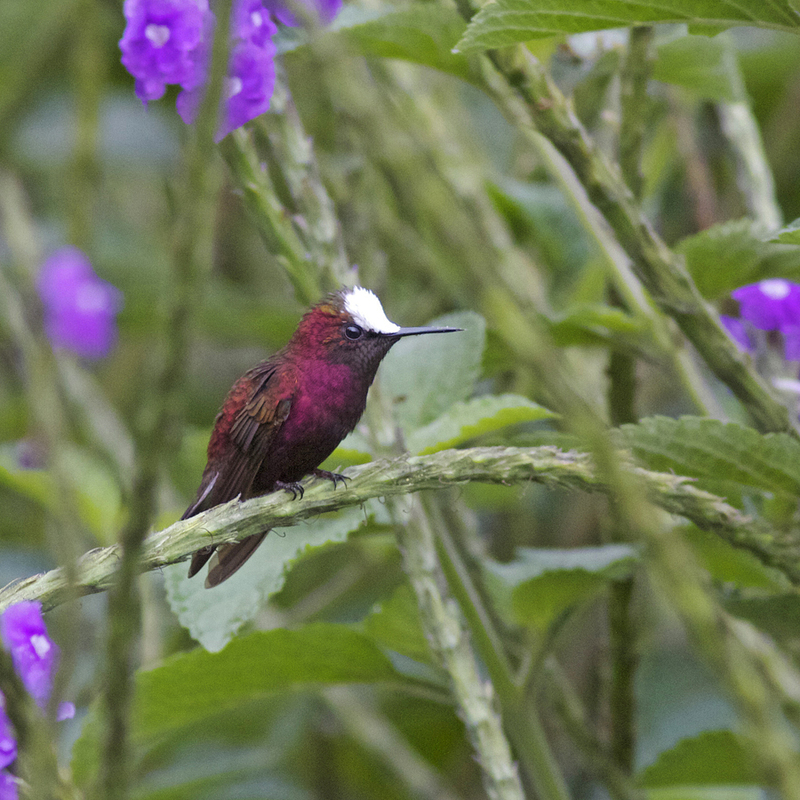 The male Snowcap defends his feeding territory against others of the same species, but is readily displaced by larger hummingbirds. They usually visit small flowers of vines, trees and epiphytesfor nectar, and also take some insects, especially when feeding young. The call of this species is a high-pitched tsip, and the male’s song is a warbling tsitsup tsitsup tsitsup tsuu ttsee. It is a resident breeder in Honduras, Nicaragua, Costa Rica and western Panama. Its habitat is the canopy and edges of wet forest, and it will also use adjacent more open woodland. It occurs mainly on the Caribbean mountain slopes, breeding mainly at heights of 300–800 m. After breeding, most descend to the adjacent lowlands, but some may wander up to heights of 1400 m.